Teads, founded in 2011, is the inventor of outstream video advertising and a global monetisation platform for publishers. Publishers work with Teads to create brand new video inventory and manage their existing inventory, monetising it through programmatic buying, their own sales force, or third parties. Teads’ outstream video advertising solutions comprises a series of formats inserted deep into media content, including articles, slideshows and news-feeds. It is changing the game within the video advertising market by creating unprecedented levels of premium inventory, which did not exist before. Worldwide, Teads has a global reach of 730 million unique users. In the UK alone Teads reaches 32 million people which is 70.5% of the internet population. Our suite of premium publishers includes The Guardian, The Telegraph, Conde Nast, London Evening Standard as well as Reuters, Forbes, The Washington Post, Le Monde, O Globo and Die Welt, which ensures that you’re able to scale your video campaigns globally. According to Teads research, 68% of consumers underestimate the amount of revenue that advertising contributes to media sites. This may be due to the fact that many display and video ad units aren’t designed to ensure the best user experience. In order to avoid these ads, many have installed ad blockers – which remove frustrating ads, however cuts off revenue that online content producers desperately need. Teads are the inventors of outstream advertising; where ads are served outside the video stream and in the heart of content. This has allowed publishers to monetise their editorial without having to create costly video footage to place pre-roll in front of it. This distribution method differs from instream, comprising of video ads which run before, during or after video content. However, for many brands who have carefully crafted their creative, user generated content is not the premium environment in which they want to appear. In a recent Forrester report produced for Teads, agencies, advertisers and media companies felt that outstream ads would continue to be an important part of their ad portfolio, with 77% of agencies and 70% of advertisers agreeing it would be ‘more’ or ‘much more’ important in the future. Similarly, 60% of media and publishing professionals felt that outstream provides a better end-user experience than other digital video advertising formats and 67% felt that more inventory means they were able to execute video sales programmatically. Outstream is now mainstream and we’re proud to be the pioneers and inventors of it. While programmatic video is booming the subject can be a minefield. It’s the fastest growing sector in terms of ad spend according to eMarketer, attracting $29.3bn globally in 2015. Video is also heading programmatic with the UK leading the way. At Teads alone we saw our revenue grow by 300% YoY in August 2015, with further growth expected. Although programmatic is often associated with speed of delivery and cost effective placements, native video can also be traded programmatic as long as it is standardised. Teads’ inRead uses outstream formats to offer targeted video, delivered programmatically for brand campaigns. And as for mobile and programmatic – it’s huge. Smartphones are the main screens we view, and mobile programmatic ad spend is expected to grow 87.5% to reach £1.01 billion in 2015. It will account for 68% of UK programmatic ad spending – making mobile the most important device for programmatic. Teads specialises in video advertising. 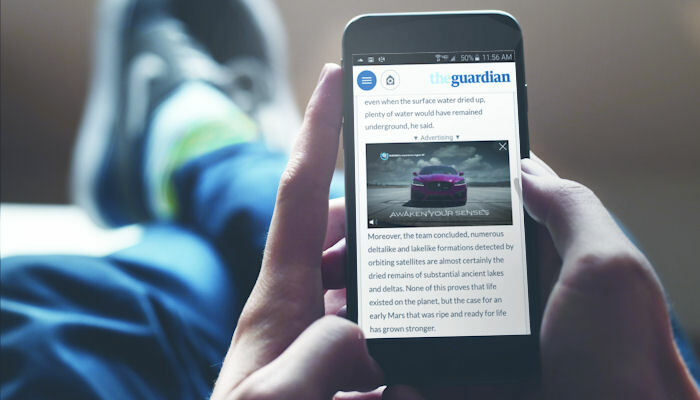 Our flagship format, inRead allows video adverts to be placed in the heart of editorial content, using our network of premium publishers which include The Guardian and The Telegraph. Click here for a demo of inRead. inRead is an innovative format which positions video advertising within the heart of editorial content. Viewable by design, the format launches when in view on the screen, pausing when less than 50% in view and merging seamlessly back into the page once the view has been completed. inRead can be bought on a CPCV, CPM and CPV basis. We believe advertising should enhance a user’s experience of a publishers’ site. We champion opt-in, premium and relevant advertising and make sure that ads appear at the right time, on the right screen for the end user. We provide a solution to video viewability. inRead is placed in the heart of editorial content - it only launches when in view on the screen and pauses when less than 50% visible. If the user choses to skip the ad, advertisers don’t pay a thing. This approach to viewability goes much further than IAB and MRC guidelines. inRead works seamlessly cross desktops, smartphones and tablets (including in-app and iOS). Teads is the first platform which allows video advertising to be delivered within all types of content, on every device, empowering brands to reach their audience within a premium environment. Buy the way you want. Brands can buy the way that suits them – either via our Video Private Exchange, Open Exchange or Managed Services.